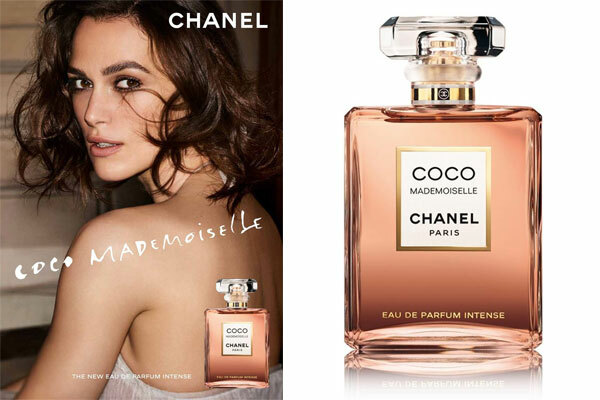 Keira Knightley for Coco Mademoiselle Intense fragrance, an oriental amber perfume for women. Created by perfumer Olivier Polge, this warm floral scent includes notes from the original Chanel Coco Mademoiselle eau de parfum with an extra dose of faceted patchouli with an amber accord of tonka bean and vanilla absolute. Launched in March 2018, the rose floral fragrance is available in eau de parfum spray (1.7 oz, 3.4oz / $110 - $140) from Sephora, Macy's, and Nordstrom. The new perfume campaign was directed by Johan Renck and features Knightley wearing a Chanel dress.